SimExams is pleased to announce computer based test software for iOS devices with latest version. Developers has designed this software with a great deal and user friendly to use. This software is used to conduct exam(s) with or without internet connection. 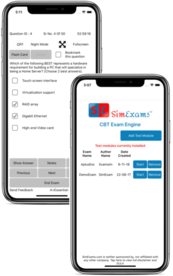 The user could easily install and use this native application on their mobile and tablet devices by using this link http://www.simexams.com/products/cbt-exam-engine-ios.htm. The user interface is specially designed and configured for each icon and button placement to enhance the user experience. This simplified Application Provided with substantial price and the software is rich in features such as support for different question types, bookmarking, statistics, and customization. The app is designed with different modes like learning and exam mode. One can configure the exam as per their needs.